Add professional touch to your presentations. • Simple affordable envelopes to deliver photographs. • Great for School pictures, event photos & sports teams. • Paper Envelopes with a clear window. • Can also be used as a photo mailer. • 9'' x 12'' envelope window measure 8 7/8'' x 11 5/8''. 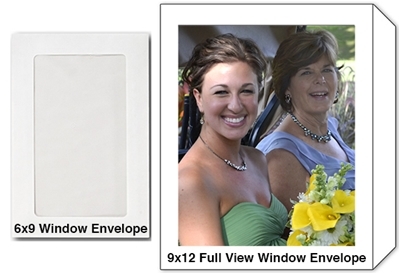 • Choose from the two sizes of Plain White style photo envelopes.